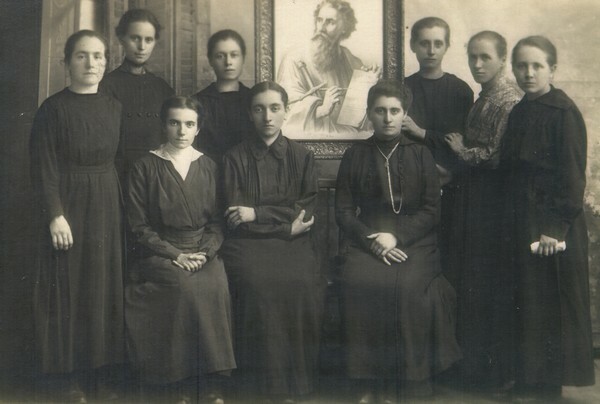 Why the Title “Co-Foundress” of the FSPs? According to the Catholic Encyclopedia, a co-foundress is a woman who played a sig­nificant role in what the [Institute’s] Founder accomplished. And from the very beginning Maestra Thecla played an important role by collaborating in a substantial way with the Congregation’s Founder in the formation of its members, in its development, in the prep­aration of its Constitutions, and in every act carried out by the Institute from 1922-1964.
a great woman, a perfect religious, an en­lightened co-foundress, open to the needs of our times, but also a humble and faithful ex­ecutor of the divine will, who during her life sought only and always to expand the glory of the Lord and do good to souls. Prima Maestra was a faithful executor of a significant part of what the Founder con­ceived of for the Daughters of St. Paul. Those of us who lived with her can witness to the fact that she was indeed extremely faithful in this regard. In the beginning, things were not clear. The Church had not yet given her imprimatur to the Congregation and the instruments of social communication were not yet viewed in the light in which they are today, after Vatican Council II. Thus it was not easy to implement the Founder’s ideas. Yet Prima Maestra did this–not blindly but intelligently, seeking to launch the initiatives presented to her by Primo Maestro. Conse­quently we can say with a certain degree of confidence that Prima Maestra Thecla merits the title “Co-Foundress” of the Daughters of St. Paul. (This proposal passed by unani­mous vote: 80 “yeses”). [M. Thecla] guided the Congregation for 48 years and succeeded in cementing its members and communities among them­selves with a strong sense of belonging. She was the soul of its organization and apostolate. She left ample breathing room for initiatives but she was also vigilant, if necessary reminding everyone of essential principles. Her life could be defined by the word fidel­ity. She was a woman faithful to God and to her vocation. With great spontaneity and simplicity, she allowed God to work in her and he accomplished great things through her. We witnessed these things but were un­aware of just how remarkable they were because they were done in the style of God. 1 Romana, Canonizationis Servae Dei Thecla Merlo, Rome 1967.